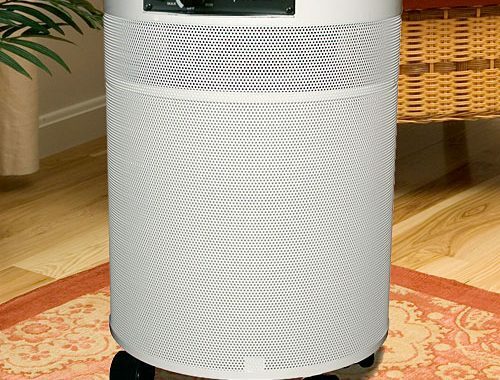 The Winix WAC5300 is a great air cleaner for rooms up to 350 square feet (32.5m2) and costs between $130 and $180. Very good price for such size space. The Winix WAC5300 contains a 99.97% efficient True-HEPA Filter, Odor Control Carbon Pre-Filters, and PlasmaWave Technology. 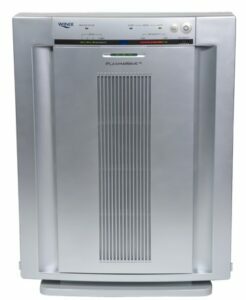 The Winix Plasmawave 5300 air purifier is medium size. Height is 21.7 inches (55cm), width 19.i in (48.5cm) and depth is 8.5in (21.5cm). Depth is narrow so air purifier will easily fit in smaller place. You can put it close to walls because air outlet is on the top of the unit. The air purifier has attractive and lightweight sleek design, metallic silver color. Weight is 15lbs (6.8kg). Unfortunately, there is no handle to carry it from room to room. The Winix 5300 has a motor and a fan that moves dirty air through filters. Filters purify the air. This model has 3-stage air cleaning. First is carbon pre-filter to capture offensive household odors caused by pets, smoke, cooking, and many other odors found within your home. This filter is also coated with CleanCel to neutralize germs and bacteria upon contact and extends the life of your True-HEPA filter. Second is true-HEPA filtration by capturing 99.97% of airborne pollutants as small as 0.3 microns, like allergens, pollen, mold, dust etc. The final stage is PlamaWave technology that attacks pollutants at the molecular level to neutralize viruses, bacteria, chemical vapors, odors, and harmful gasses in the air, without producing harmful ozone. On the top of the unit is ergonomic electronic controls. The biggest is the power button. Next to it is speed/mode button – you can change between auto and sleep mode. 4 speeds – low, medium, high and turbo. Filter replacement indicator will illuminate when to replace the true-HEPA filter. Air quality indicator shows current level of air quality in your room. Air quality sensor automatically monitors air quality level and adjusts fan speed accordingly. As others air purifiers – loud on the highest speed and quiet on low. The Winix PlasmaWave 5300 air purifier uses a smart light sensor to detect if s room is dark or light and when the sleep mode is on and the room goes dark, the air purifier automatically adjust to the lowest fan speed for ultra quiet operation and dims the display lights to reduce light distraction as you try to fall asleep. Recommended max for 350 square feet. Ceiling height 8 feet. Time needed to cover all air in 350 square feet room. Very good result. Winix air cleaner is simple to maintain. Carbon pre-filter should be replaced every 3 months. 4-pack costs around $40. 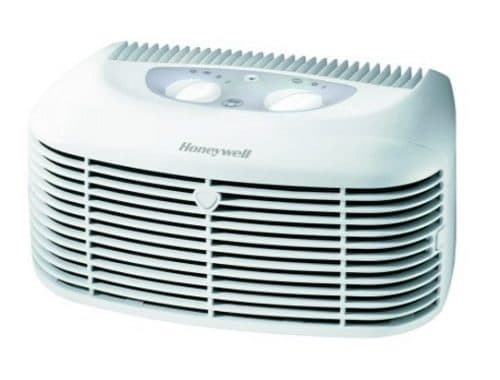 Replace true-HEPA filter when the indicator light turns on. Under normal use, the HEPA filter should last 12 months depending on air quality. Costs around $70. Winix 5300 uses only 6 watts on speed 1 and 90 watts on turbo speed. But turbo speed is rarely used. Most of the time you will use first 3 settings and they are economical. The Winix PlasmaWave 5300 in my eyes has proven that is a very good air purifier. Price is affordable, covers space up to 350 square feet. Great digital controls with filter replacement indicator, auto mode, sleep mode, air quality indicator, and air quality sensor. But the sad thing is that you can’t turn off PlasmaWave function. I would suggest to pay $30 more and buy Winix 5500. It has a remote control and with it can turn on/off PlasmaWave function. It covers same space. Plus the main filter in it can be washed instead of replacing it. That’s something like a $60/year savings so it will pay for itself if it lasts a few years. Quiet on low setting – good for sleep. Excellent value for the price. The Winix PlasmaWave 5300 air purifier is low priced and has a lot of high-end features such as a filter change indicator, air quality sensors, auto mode, and sleep mode. It does not produce ozone, it removes it. Annoying electric whizzing when the PlasmaWave feature is enabled. And the sad thing is that it is enabled all the time – you can’t turn it off. Click here to see how Winix PlasmaWave 5300 looks compared to it’s competitors. Posted in Air Purifier Reviews, Reviews and tagged Air Cleaner, Air Purifier, True HEPA, Winix PlasmaWave 5300.